1. A diploid plant cell contains 2 billion base pairs of DNA. (a) How many nucleosomes are present in the cell? (b) Give the numbers of molecules of each type of histone protein associated with the genomic DNA. Each nucleosome encompasses about 200 bp of DNA: from 144 to 147 bp of DNA wrapped twice around the histone core, from 20 to 22 bp of DNA associated with the H1 protein, and another 30 to 40 bp of linker DNA. Thus, there are approximately 10 million nucleosomes in the cell. (b) Each nucleosome includes two molecules each of H2A, H2B, H3, and H4 histones. Therefore, there are 2 X 107 molecules each of H2A, H2B, H3, and H4 histones. Each nucleosome has associated with it one copy of the H1 histone; so there are 1 X 107 molecules of H1. 2. A renaturation reaction is carried out on the genomic DNA from three different bacterial species. 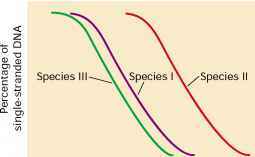 Species I has a genome size of 2 X 106 bp, species II has a genome size of 1 X 108 bp, and species III has a genome size of 1 X 106 bp. Assume that the same total amount of DNA is used in each renaturation reaction and draw a C0t curve for each species, showing the relative positions of each species on the same graph. At the start of the reaction, all the DNA is single stranded; so the proportion of single-stranded DNA is 1. As the reaction proceeds, single-stranded DNA pairs to form double-stranded DNA; so the proportion of single-stranded DNA decreases. This decrease will occur at a low C0t in the organisms with a smaller genome, as shown in the following graph.